There was a knock on the door and my children new it was the FedEx man because they heard his truck stop. As soon as he saw the brown delivery box, my son asks, “Are these toys for me?” How did he know they were toys?!?! I had not told my kids that anything was coming. He must have a built in radar for great toys. 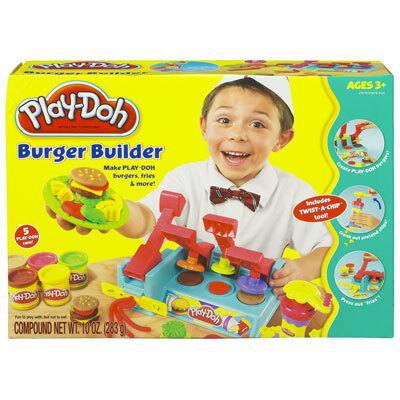 The Play-doh Burger Builder came with 5 cans of play-doh, molds, press, a plate, a plastic knife, a rolling pin, and TWIST-A-CHIP tool. The set up was easy, we just had to snap on the large press lever and the boys practically did that on their own. After they put it all together and got situated, the boys set to work building burgers and creating their own “versions” of food. They loved it! Giggles started immediately! They had fun trying all the different attachments and of course making their own colors, too. If I let him, I think my son would keep this out and play with it all the time! This is one of those toys that my son starts looking for when I am in the kitchen making dinner and he wants to make his own food. My only complaint would be that the Play-Doh colors get all mixed together, but find me some dough that does not get it’s colors all mixed up and I will wonder what chemicals are in it and if it is even safe! Besides, if the colors do get mixed together, it is a great opportunity to teach your child how colors are made. After looking over the Play-Doh site, I was impressed to find out that their dough is basically made up of salt, flour and water. Another cool thing I found on their site is their Fresh Ideas page. They have a whole page of things you can create with Play-Doh with different difficulty levels, like the ones below, and then they give you step-by-step instructions on how to create it. How fun is that?! Since my daughter is the 2nd child under a boy, we have very few girly things. She was so excited to have a girl toy and something she could “re-design” She sat in her room for quite some time playing with Mrs. Potato Head. I think it is a great opportunity for her to learn where eyes, noses, ears, etc. go. She can place them where ever she wanted on Mrs. Potato Head, and it was okay, but she started to pay attention to the placement of these on others. My only complaint is, that the back (the storage area) kept popping in whenever I tried to put something on, but it was easily pops back on. I do not think it could ever break and it never pops off when my daughter is using it. I just do not remember it doing that so easily when I used to play with them when I was little. I was wishing it were possible to buy extra parts, so we could have some more variety and on the Playskool site I found the Mrs. Potato Head Silly Suitcase . It comes with 40 extra parts and the case, which would be perfect to store everything in, especially the larger pieces. 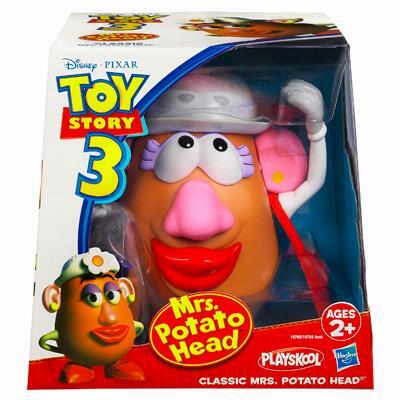 This will definitely be on our Christmas list and maybe one more Potato Head so the kids do not fight over the one anymore! So, what is your favorite Playskool toy? Disclosure: I received no compensation from Playskool other than these two toys. The opinions expressed are solely my own. We love our potato heads! My son recieved one for christmas at age 2 and then a second one we purchased at almost 3. The silly suitcase is great, but we found it only holds the parts and not the heads. I don't know how packaging at Playskool got it all in there…it is not recreateable at home. We purchased just parts while we were on vacation at Disneyland last fall. There is a toy shop in California Adventure that sells parts by the masses. It is a pick and choose deal. 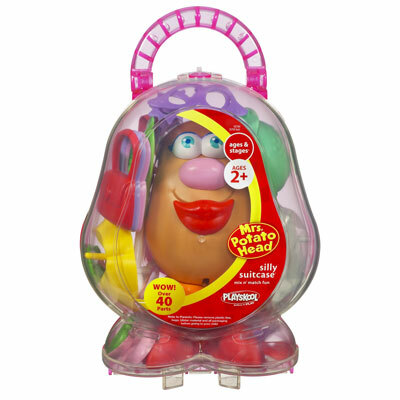 There is a child's size shoe box for $20 or a large plastic faux potato head for $40 (holds roughly 3 of the small boxes). As long as the lid closes they dont care how much is in it. We literally got one of everything, plus extras of things he really liked for $40. It was a game to see how much we could fit in it. And oddly, we find one head has the back pop off and the other is what we expected from when we were kids (nice and secure). When we were shopping at Downtown Disney, we were thrilled to find that they have parts for Potato heads from Disney movie characters! My boys still collect Mr. Potato Head from Star Wars, Indiana Jones, etc. to display in their rooms. Great review. I can still remember the smell of Play Doh after 50 years!!! I wonder if it smells the same now. You have a fantastic blog, and your gift with children and crafts is a lesson for everyone.